It’s been a strange year for sport. A team of Geriatrics made the NBA Finals, taking the defending champs to 7 games. Two teams who had never won a World Cup played for the championship. 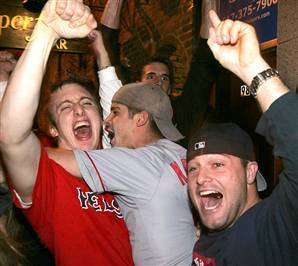 A team (avert your eyes, Bostonians) with a 3-games-to-zero playoff series lead melted and lost in Game 7 on home ice. At baseball’s all-star break, 3 teams who didn’t finish last year with a winning record lead their divisions. The once-unflappable Tiger Woods flapped and, ultimately, folded. A tennis match lasted over 11 hours, spanning 3 days. The Miami Heat built a basketball franchise that promises to be hated by all. But when the year is over and Time Magazine writes its Person of the Year issue, these instances will all be asterisks, if that. Sport in 2010 will be marked neither by tragedy nor travesty, but rather by life running its course. Not 40 days after John Wooden – The Coach – passed away, so, too, did The Boss. George Steinbrenner was, no doubt, a polarizing figure, but nowhere more than in the Bronx. 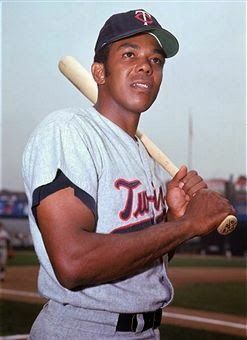 What he represented drew the ire of eyes in Boston, Queens, Atlanta and Los Angeles, to be sure, but it wasn’t until twenty years into his ownership of the Yankees that his own fans warmed to him – and then, only after a three-year, league-imposed hiatus from the game. 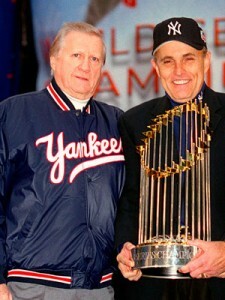 Steinbrenner, Guliani and the World Series trophy in 2001 during an Esquire Magazine photo shoot. But this is not a history lesson. No, this writer prefers to leave history to those more historically inclined. Steinbrenner’s passing happened at a fitting time; it was, after all, the one day of the year in which there is no sports news for ESPN or any other outlet to break. And, let it be known – even in the opinion of one who often criticizes ESPN for capitalizing on narcissistic moments in sport – that ESPN covered the passing of The Boss admirably, devoting an entire morning and early afternoon of coverage to Steinbrenner, his friends, once and former co-workers and the rest. I am a Boston fan. I grew up in Upstate New York, with the exception some instances during my childhood in which I was transplanted in Massachusetts’ South Shore. That was enough to sell me on the Red Sox and Bruins and Celtics and Patriots, despite the fact that for most of the year I was surrounded by a majority of Yankees, Rangers, Knicks and Bills fans. That does not make me immune to feeling the same chills that so many others probably felt this morning when Bob Knight, during a phone interview on SportsCenter, broke down crying not once, but twice while talking about Steinbrenner. Or when Dave Winfield got choked up on camera. I’m almost afraid to watch Derek Jeter’s interview, when it comes. Baseball is the one sport whose season takes place without much competition. Sure, there is the occasional major golf or tennis tournament and every other summer, the World Cup or Olympics take center stage for a few weeks. But really, baseball goes from April to September without rival – it is only its postseason that is really challenged by other, regular sports. So to say that Steinbrenner was almost single-handedly responsible for making baseball what it is today might seem like an overstatement.